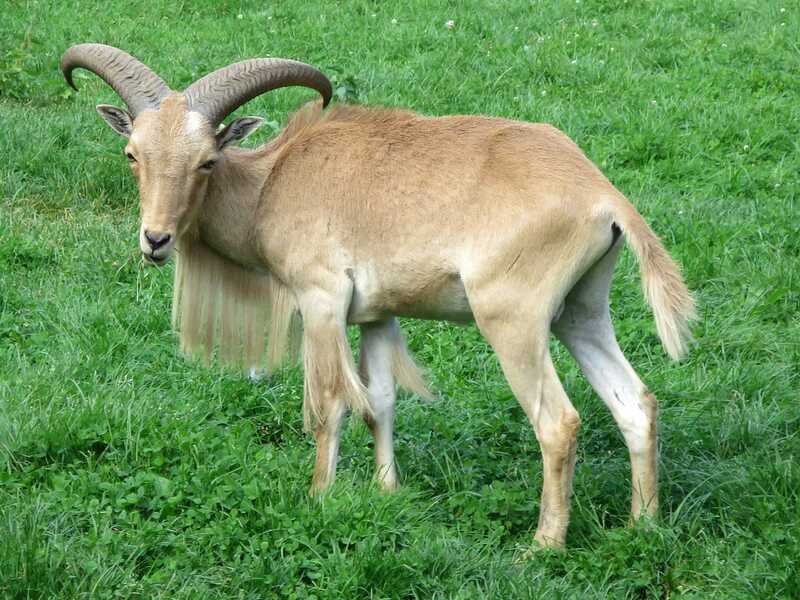 Seven years ago I spent a few pleasant hours at Belantis, a six year old park located just outside Leipzig. My trip report from that day was for the most part positive, and even now I remember being impressed by both the custom water ride and the Gerstlauer Bobsled coaster. I made a second trip just fourteen months later when the park added a Gerstlauer Eurofighter, and though my report from that day only discussed the new coaster it was nevertheless evident that things were beginning to go downhill, an impression subsequently confirmed by several other enthusiasts who visited that year. Today I drove into the parking area with an open mind that was tested almost immediately by the sight of a full diaper on the ground that had evidently been abandoned several days before, and I'm sorry to report that things didn't improve from there. As we approached the main gate we were accosted by a middle-aged man who started jabbering at us in the local patois. It would have been sensible to ignore him entirely, but we made the mistake of trying to deflect him with a polite "Ich spreche kein Deutsch" that resulted in his script switching to English. He apparently had discounted tickets for sale, and his attempt to push them on us continued unabashed as we made our purchase from the official booth, its occupant entirely unfazed by the presence of a scalper on park property. With tickets in hand we headed for the main entrance, where we found a large crowd milling around in the manner of patrons at a rock concert. The root cause turned out to be a live broadcast by LandesWelle Thüringen that was being relayed over a temporary speaker system at piercing volume, albeit badly; the level of distortion was such that I can't imagine even native German speakers would have wanted to listen to it for long. 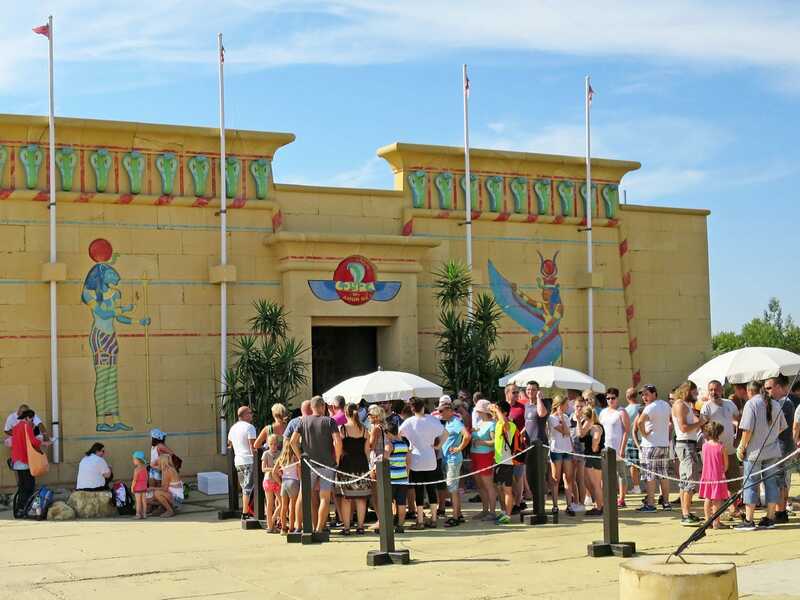 We pushed our way through the multitudes and headed for Cobra des Amun Ra (#2295), a family coaster added to the park last year. There was a short queue outside the ride entrance with a few token umbrellas providing shade, and we duly joined it. A brief look at the thermometer on my watch indicated an ambient temperature of 37°C, but that apparently wasn't warm enough for one of the locals, who promptly lit a cigarette and sprayed the entire area with second hand smoke. Several minutes later a light came on at a turnstile which allowed a bunch of people into the ride building, but there was no countdown indicator, resulting in the group directly in front of us being separated on either side of the barrier. They seemed unconcerned by the red light and duly jumped it, though we decided to wait for the next round. When in due course we were able to follow them we discovered a lengthy enclosed queue that was well themed, pleasantly cool, and almost completely deserted. The walk from one site to the other was completely unhindered, making me wonder why on earth we'd been grouped outside in the oppressive heat. In an English-speaking country I'd have gone straight to Guest Relations to seek an explanation, but with no command of the language there was little choice but to simmer quietly. The queue terminated at the front of the station, and herd mentality resulted in a traffic jam as the majority of people tried to go for the seats in front of them rather than filling all available space. We eased our way around the side of the crowd and into the third row from the back, and moments later we were on our way after a remarkably efficient restraint checking process. As we moved into daylight the beautiful theming vanished entirely. It felt like we'd been teleported from ancient Egypt to a temporary modern fairground as the train rose up the lift of a plain white coaster installed on an uneven gravel surface with only a few random pieces of construction debris for decoration. The fact that not even a token effort had been made for landscaping on a year-old ride was more than a little disappointing. Despite its lacklustre appearance, however, the ride tracked smoothly and delivered a moderately forceful experience broadly equivalent to that of its twin at Duinrell. The most enjoyable portion of the morning (aside from leaving the park) was the five minutes we spent on Fluch des Pharao, a Hafema-built water ride that can be thought of as a development of the log flumes of yesteryear. The eight seat rubber boats are rectangular in shape and are guided through a narrow trough, but there are areas of rough water and a few special elements, notably a vertical lift and a sharp twisted descent designed to look like a whirlpool. It'd be remiss of me not to note however that once again guests were being grouped outside in the sun for no obvious reason when there was a perfectly serviceable themed building available. When the turnstile turned green we had thirty glorious seconds of shade before exiting into another twenty minute wait in the sun, a process shortened marginally when there was a call for a group of two. I'd decided to keep Megan company on Huracan against my better judgment, but the operators would not allow me to wear my strapped glasses, giving me the excuse I needed to sit out a ride that six years ago had been unpleasantly rough. Time had apparently not improved it; she disembarked with a stern facial expression that made it clear that my decision not to ride was the correct one. Her notes compiled later that evening were candid and to the point, describing it variously as "abysmal", "one of those rides where I simply could not wait for it to be over", "one of the worst coasters I’ve ever ridden", "the worst Eurofighter I’ve ever been on", "like a full body assault", and perhaps most damning of all, "on the level of the Prater Volare". 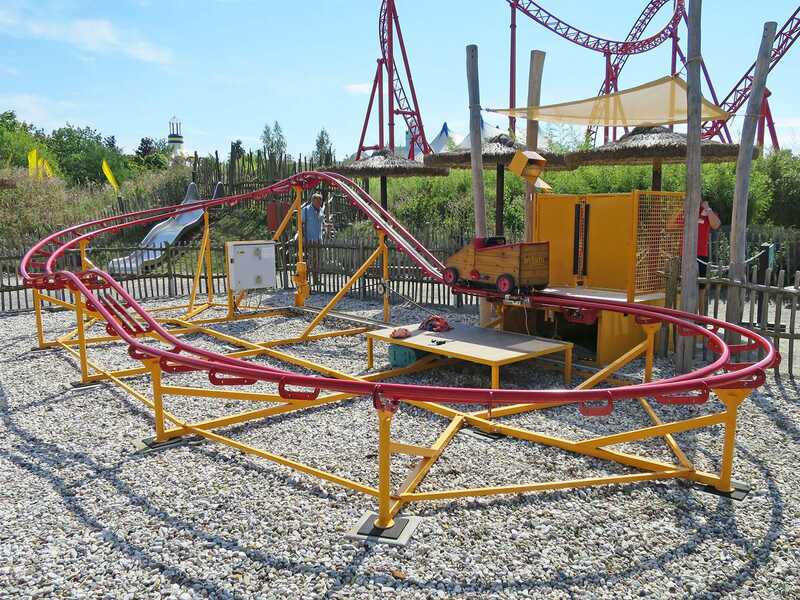 The park was one of five in Germany to add a Gerstlauer Kiddy Racer in 2014, a miniaturised coaster that I'm convinced was only developed to annoy coaster counting enthusiasts. The park web site makes it clear that this ride is nicht geeignet für Schwangere, or not for pregnant women, but the reality is that it isn't suitable for anyone over about thirty-six inches in height; as with the other installations the only way we'd have fit in Huracanito was double amputation. To that end, the closest I ever expect to get to experiencing this ride is the POV which captures two laps in full high definition glory. We made our way over to the other side of the park for a lap on Drachenritt, which today was running fairly well. The lift hill was shuddering quite badly, but it was the only bit of the ride where comfort was an issue; the hairpins were negotiated without fuss, and there was some airtime to be had on the lower level. It would have been nice to be able to queue without breathing in tobacco fumes, but on the positive side the wait time wasn't dreadful. The schedule for our day gave us two options. One choice was to stay at Belantis until late afternoon, which would have given us time to try the various flat rides. The other was to relocate to a nature park just outside of Berlin with a pathetic kiddie coaster. The decision process took slightly less than two zeptoseconds, and would likely have ended the same way even without the presence of another credit. Our main desire was to avoid a repeat of what had happened earlier in the year when an enjoyable holiday ended on a sour note, and given that we'd probably have chosen to spend the day watching paint dry when the alternative was spending more of our lives in a park best described using a four letter word that rhymes with knit. It was a busy afternoon at Tierpark und Freizeitpark Germendorf. The main car park was virtually full when we arrived, though some of the early arrivals were beginning to leave, allowing us to lay claim to a spot within fifty metres of the entrance. Despite the late hour there was a substantial queue to purchase tickets, and we ended up waiting almost ten minutes for the privilege of handing over €9.50 apiece. The cashier, who spoke flawless English, warned us that we'd need a fifty cent coin in order to leave the car park, and we duly put one aside. The entrance building looked fairly nondescript from the outside, but it opened out onto a very pleasant tree lined walkway with lakes on both sides. We saw guests of all ages paddling in the water as we purposefully headed towards the Butterfly (#2296), which we found next to a standard selection of Heege products, all of which were priced at €1. There were plenty of guests milling around, and as a result we ended up waiting two cycles, but it was worth it for what turned out to be a really enjoyable ride. It wasn't intense, it wasn't thrilling, it wasn't even exciting, but it was fun. If I had a garden big enough I'd contemplate installing my own version; I'm confident it could be paid off in a few short weeks by setting the ticket price for enthusiasts to "your current coaster count" in Euro. We were left with about thirty minutes to walk around the various animal exhibits, and that wasn't anything like enough to cover the whole facility. Given that, we decided to pick a path at random, which turned out to be a looped route featuring goats, ponies, ostriches, ducks, and cows. There was a couple taking elaborately staged wedding photographs in front of the latter, demonstrating that coaster enthusiasts are not in fact the only slightly odd people in this world.